Washington (CNN) – Sen. Ted Cruz got a lot of pushback from Republican colleagues during a closed-door meeting questioning his relentless effort to tie government funding to derailing Obamacare. "Cruz was completely unapologetic about the ads that he is featured in on the Senate Conservatives Fund website that attack other Republicans. He sees himself as the only truly pure Republican. His colleagues are furious. He has no successful strategy but has managed to generate grass roots support for his position," one senior Republican source at Wednesday's meeting told CNN Chief Political Analyst Gloria Borger. Cruz has urged Republicans in the House to stand firm and continue pushing any plan to fund the government to proposals aimed at curtailing the Affordable Care Act. This summer, he appeared in ads produced by the Senate Conservatives Fund urging Republicans to push Congress to defund Obamacare. This strategy has upset Senate Republicans and some House GOP members because some privately blame the freshman Texas lawmaker for causing the shutdown and boxing House Speaker John Boehner into a corner. Cruz's spokesman did not have a response to reports of pushback during the Wednesday meeting. Cruz told Politico the media loves to cover internal Republican disagreements and "apparently some senators are content to fuel those stories with anonymous quotes." Cruz also was unapologetic talking to conservative talk radio host Laura Ingraham earlier Wednesday. "We've had now three times, the House has endeavored to pass compromise bills that would keep the government funded, but at the same time would start to address the enormous harms that Obamacare is inflicting on the American people. And three times, Harry Reid has said 'no, absolutely not, I will not talk, I will not compromise, I will not do anything – no.' And as long as he maintains that absolutist position, both Reid and President Obama have said they won't even sit down to talk. They want a shutdown," he said. At a previous meeting of Senate Republicans, Sen. Susan Collins spoke about some of the ads in Maine that said she was not conservative enough, blaming Cruz for helping to divide the party. During the Wednesday session, many senators spoke out and aimed their comments directly at Cruz, the GOP source told Borger. While Cruz initially drew the anger of some Republicans weeks ago when the House passed the first bill to keep the government operating only if Obamacare was defunded because Democrats controlled the Senate, he then staged a 21-hour talkathon last week trying to prevent the Obamacare provision from being removed. He lost that effort but helped cement his stature with the Republican base. That caused some Republicans to go public with their consternation. Asked why Boehner can't bring up for consideration any bill he wants, Rep. Devin Nunes, R-California, told CNN Wednesday night that the "leadership made a decision to take the position that we are going to take the Ted Cruz strategy, and we are not going to fund the government until we get rid of Obamacare." Nunes blames Cruz for causing the GOP not to have a choice and causing a shutdown. 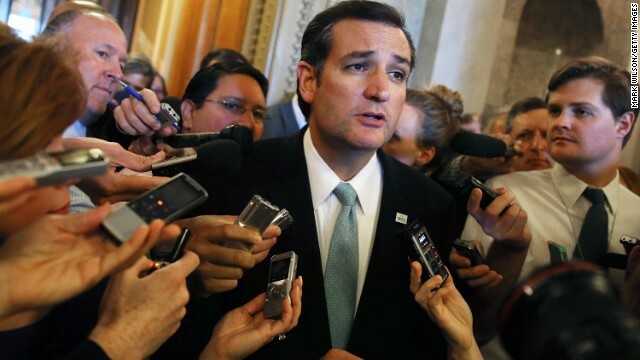 "John Boehner said we'll take this Ted Cruz strategy. You guys went out for two months, made these commitments. We'll take it. We'll implement it. And now, here we are, it's fully implemented. ... I think Ted Cruz is one of the best politicians that's come around in a long time. He's able to rally the base, he's got a lot of money … There's a lot of consultants making money off this and lots of TV ads going on. The problem with it is, it's one thing to be good at politics. It's another thing to be not good at strategy." Rep. Peter King, R-New York, has previously called Cruz "a fraud" for his promises of defunding Obamacare. But other Republicans are not backing away from Cruz, including Virginia gubernatorial candidate Ken Cuccinelli, who is scheduled to hold an event with the senator on Saturday. For Democrats, there is little question of who is in fact leading the anti-Obamacare effort and are eager to highlight Cruz's efforts. "Senator Cruz is now a joint speaker," Reid said Thursday on the Senate floor. "He lectures the House on occasion as he does people over here." Mo Elleithee, communications director for the Democratic National Committee, said in a statement regarding Republican National Committee chairman Reince Priebus: "I think he probably has Speaker Cruz Boehner's number somewhere." - CNN's Kevin Bohn and Bryan Koenig contributed to this story. Cruz and his buddies are waging economic war on most of the united states middle class, it will come back at him, hes just too stupid to realize it. TeaParty Caucus is only a handful of GOP; What Harry & Barry really fear is what they represent: an earthquake of civil discontent with the progressive, statist agenda. A tsunami of traditional American voices for smaller government & balanced budgets will soon flush away the DC sewage. Ted Cruz has a handle on the plunger. Ted Cruz should be sent back to Cuba where he can live with his friend, Fidel Castro without worrying about obamacare. Some people are going to make fortunes on the government shutdown . I agree Rosslaw – the whole world is laughing. US politicians appear to have the Easter Island syndrome. As soon as the republicans realize taht cruz is a member of the cruz party, in it only for self promotion and the belief that he will be president (he will not) they will be better off. boehner needs to read Tip O'Neill's book and become a leader not a follower. Ted Cruz ! What a joke! During his fake filibuster he quoted Green Eggs and Ham. He clearly hasn't read or doesn't understand the story. It is a story about a guy who opposes something purely out of his own IGNORANCE until he finally tries it and realizes that it wasn't so bad..was actually good !!! Oh ! The Irony !!! !